JACKSONVILLE, Fla. - Share the holiday spirit by donating personal care items for homeless men and women in our community. 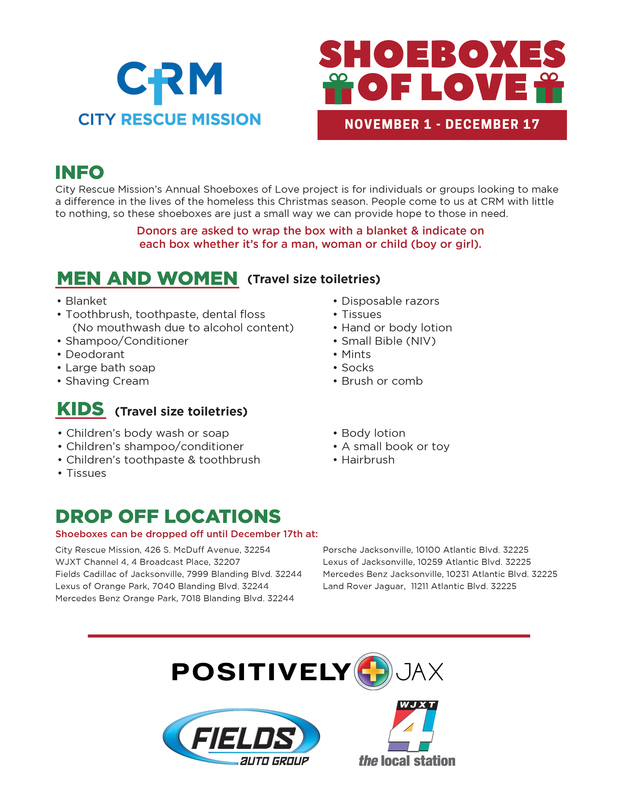 City Rescue Mission, Fields Auto Group Dealerships in Jacksonville and WJXT Channel 4 are collecting shoeboxes filled with hygiene items until December 17.. The Shoeboxes of Love project is for individuals or groups who want to make a boxed toiletry kit for a homeless person that comes to the emergency shelter at New Life Inn. Please remember that most of these people carry their possessions in a backpack and larger items become heavy. Donors are asked to wrap the box with a blanket and indicate on each box whether it is for a man, a woman, or a child (boy or girl). Shoeboxes of Love may be dropped off at WJXT studios, 4 Broadcast Place; City Rescue Mission, 426 S. McDuff Ave.; or Fields Auto Group Dealerships in Jacksonville through Dec. 17.